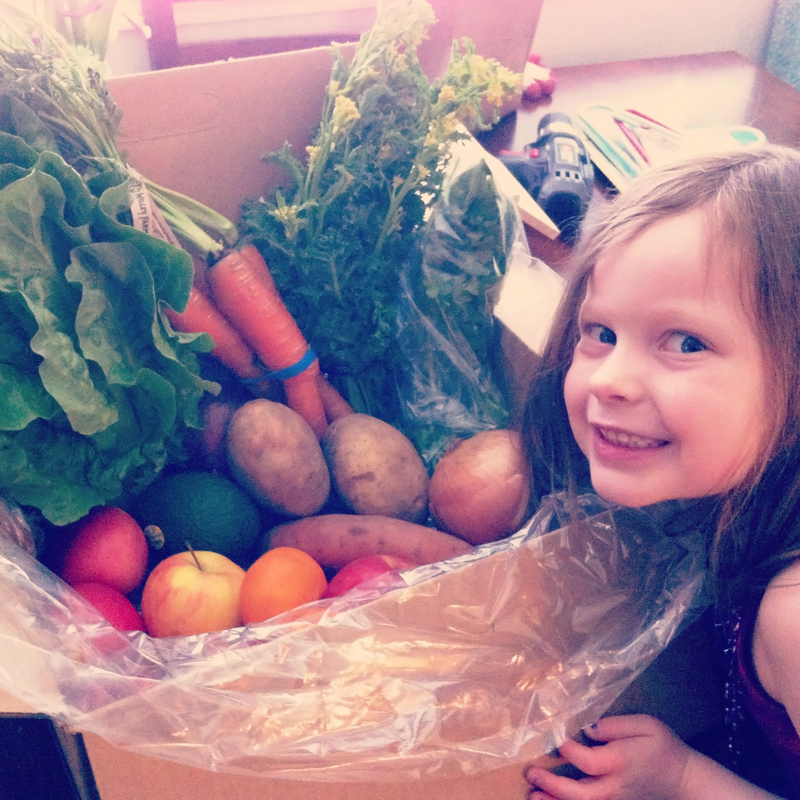 So today I got my first box of produce from Tiny’s Organic delivered to my house! I ordered from them because my friend recommended them and they have a delivery option. Here in Seattle we have a lot of options for produce but a lot of them require me to pick it up. Let’s be honest trying to pick up a bunch of produce with two small kids is just not super practical so I was okay with paying a little more for delivery. I ordered a “small farm box of fruits and vegetables” from Tiny’s. It was $25 and that included the delivery fee. I ordered mine on a Tuesday and they delivered it on Friday. From what I can tell they do deliveries on Tuesday and Friday. My daughter and I were really excited to see what was in the box. She requested this picture…and then immediately ate an orange!! They don’t tell you ahead of time what will be in our box…this could be a good or bad thing…I’m hoping it makes me try new things (like the kale!!). I felt like this was a good amount of produce and the quality was great! Everything looks really nice. I ate an apple with my lunch and it was really yummy! I also cooked the sweet potato for Bry and he ate it right up! This box is meant to feed 2 people -I think- not a family but I still feel like it was a good amount of food. I will likely order from them again – but I’m also thinking of trying out some other companies as well! I’ve heard a lot of good things about Bountiful Baskets but they don’t deliver so next up I think I will try out Full Circle – I’d like to compare a few companies and see which one I like the best! If you have a yummy kale raab recipe I’d love to hear about it! !